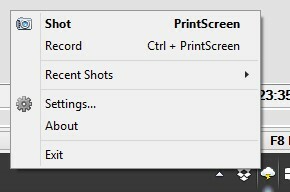 Never miss a thing you want to capture: CloudShot takes the shot of the entire screen right after you pressed Shot hotkey, click on a tray icon or select Shot in tray menu. Crop the area you want to shot, add notes if you need you, and hit Upload button. After upload is complete, link will be automatically copied to the clipboard. Just paste to you IM message, email or task manager and share it with others! Need to add some comments on top? 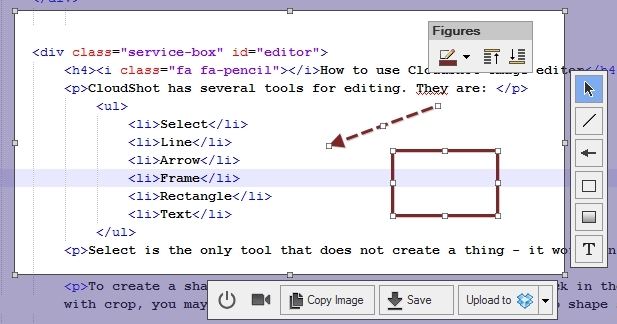 Use powerful and stylish image editor. Your edits will always look nice and clean! All graphical tools are extremely user-friendly but yet quite professional. Tired of explaining sequence of steps with text or voice? Just record it once and share GIF file with a demo. Are you keyboard ninja? All tools and functions are already binded for you! 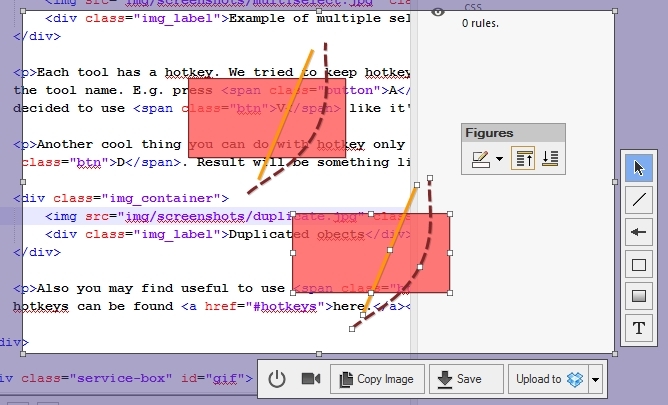 We have added all typical hotkeys like Ctrl + Enter for uploading and F2 for text changing. Feel free to try all hotkeys you know, or just follow instructions in the tooltips we have for all tools. Modern development can't be imagined without dual screen setup. And CloudShot has full support for that. You can even make a screenshot with parts on both screens! Save your shot as a file, copy it to clipboard, upload via FTP or share using cloud services like Dropbox or Google Drive. Imgur is an online image hosting service. Using Imgur for upload your shots gives you same benefits as Dropbox. But additionally you can upload images without registration - no account is needed. Public sharing is simple and awesome, but some development WIPs require certain privacy. CloudShot can upload images to FTP server in your studio, keeping everything protected and controlled by your internal IT-team. You can setup public or private access to your shots via http/https, review and manage all images any time. If you need privacy but don't have time for FTP setup, you can setup CloudShot to upload images to network drives. This will provide common access to all shots you've made to user in you internal network with 100% protection of unwanted access from outside. Whole setup as easy as picking target folder. Few clicks, and you are done! Screenshot of CloudShot System Tray menu made with CloudShot. Do we really need to go deeper?.. When you make a shot, whole screen is captured. Thus there's no need to rush - take your time and select the area on the screen you want to share, save or copy. 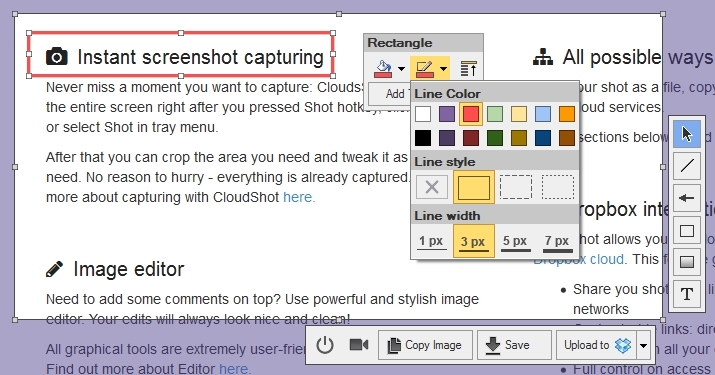 CloudShot detects windows, menus and popups - just point element you need to capture and click it - crop area size and position will automatically match highlighted element. While selecting the area, you may hold Shift button to keep area square and Space to move area of selection around the screen. Toolbar on the right has tools for editing the shot. E.g. you can add some text, arrows, lines and other shapes to explain your thoughts. Editing shots is described in the next section. Upload menu thas has 4 options: Dropbox, Imgur, FTP and Network drive. Also you can start record with selected region. To do that, simply press camera icon and follow instructions on the screen. Additonal information about recording can be found here. After you are done with editing, just hit upload button: CloudShot will upload your shot to selected storage, and link will be copied to the clipboard. After that you can paste this link to your IM message, email or task manager and share it. Yep, that easy! Select is the only tool that does not create a thing - it works only for selection. Other tools are used to create different shapes. To create a shape you need, select corresponding tool, click in the shot area and drag you mouse to set the size of the shape. Same as with crop, you may hold Shift to keep shape square and Space to move shape around. Probably, you have already noticed that - all shapes are independent objects, not just painted strokes. This is really cool feature, because it allows you to tweak shapes after creation. And you can even "transform" one shape to another one with properties change. E.g. Line can be "transformed" to Arrow, if you turn off caps. Frame will become Rectangle if you select transparent fill. 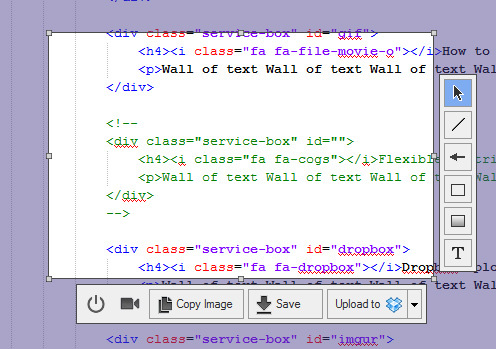 Also you can actually transform Frame or Rectangle to Text by pressing Add Text button in properties window. Impressed? Well, we are not surprised - being awesome developers is what we do on daily basis. In fact, using such shapes is so super cool and convenient that we don't have Undo\Redo system. Yeah, this may sound strange, but we don't feel it's needed, so we decided to save some time and haven't developed it. Please, don't report it as bug or suggestion, we do know about it. Each tool has a hotkey. We tried to keep hotkeys as simple to remember as possible, thus almost all hotkeys are using first letter of the tool name. E.g. press A to call Arrow Tool. The only tool that doesn't follow this rule is Select - we decided to use V like it's done in Photoshop. Also you can move shapes by pressing arrows. Each press will shift shape on 1 pixel. You may hold arrow keys to speed up movement or hold Shift button. Full list of hotkeys can be found here. Some cool feature is missing? Copyright CloudShot. All Rights Reserved.